Flail chest refers to a serious breach of the integrity of the rib cage from more than one adjacent broken ribs that are broken in more than one place each. Instead of rigidly holding the normal shape of the chest, flail chest results in a segment of the chest wall flailing back and forth in the opposite direction of the rest of the chest wall. The flailing is called paradoxical movement. When the patient inhales and the rest of the chest expands, a flail segment will sink inward. On the other hand, when the patient exhales and the rest of the chest contracts, the flail segment will bulge outward. This is a dangerous injury that requires emergency medical treatment. If not treated promptly, flail chest can lead to a collapsed lung (pneumothorax) or blood around the heart (cardiac tamponade). Flail chest and rib fractures, in general, are more common in elderly patients than in younger patients. 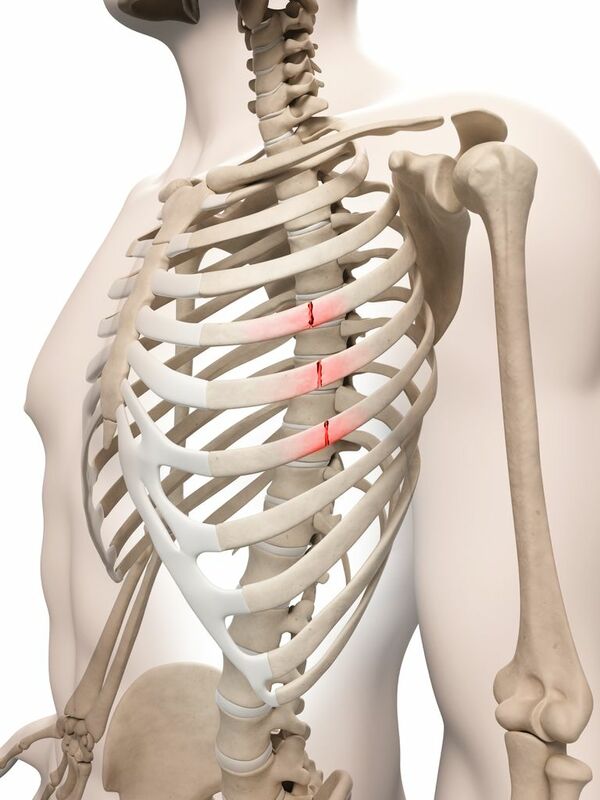 Be very aware when assessing older patients that have fallen or potentially injured their rib cages. Stay Safe. If you are not the patient, practice universal precautions and wear personal protective equipment if available. Be sure that whatever caused the injury to the patient is no longer a threat. Call 911. If the 911 operator gives instructions, follow those instructions and ignore the rest of this page. If 911 is not available, get the patient to emergency medical help as soon as possible. Stabilize the flail chest. Use a pillow to put pressure on the flail segment. Holding the flail segment in place keeps it from moving in an opposite direction as the surrounding muscle and bone. If it doesn't move, it won't cause more damage to the heart, lungs and surrounding tissues. If a pillow is not available, almost anything will do to stabilize the flail chest. Roll up a jacket or a blanket. If there is absolutely nothing available, at least have the patient lie on the affected side of the chest to discourage it from moving. Regardless how a flail chest is treated it is going to hurt, probably worse than anything the patient has ever encountered. Over the counter pain medications aren't going to do much for this level of pain and stronger painkillers aren't a good idea until emergency medical help is available to provide the full range of emergency treatment. Never take — or give to another patient — someone else's prescription medications. Always make sure that patients with flail chest get to emergency medical treatment. Failure to provide proper treatment for flail chest can lead to pneumonia and other life-threatening conditions. Balas MC, Casey CM, Happ MB. Comprehensive assessment and management of the critically ill. In: Boltz M, Capezuti E, Fulmer T, Zwicker D, editor(s). Evidence-based geriatric nursing protocols for best practice. 4th ed. New York (NY): Springer Publishing Company; 2012. p. 600-27.